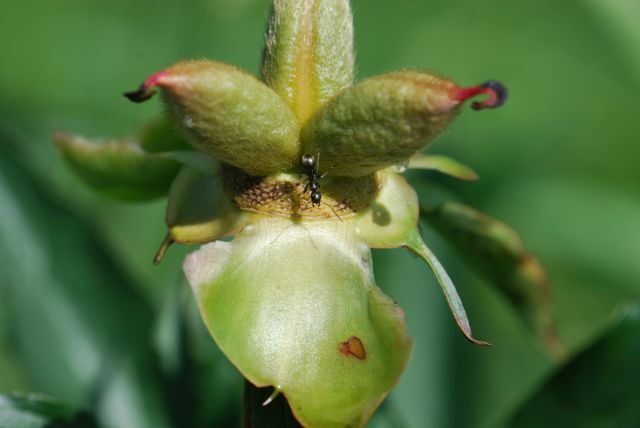 You have probably heard all about the relationship of ants and peony flower buds. 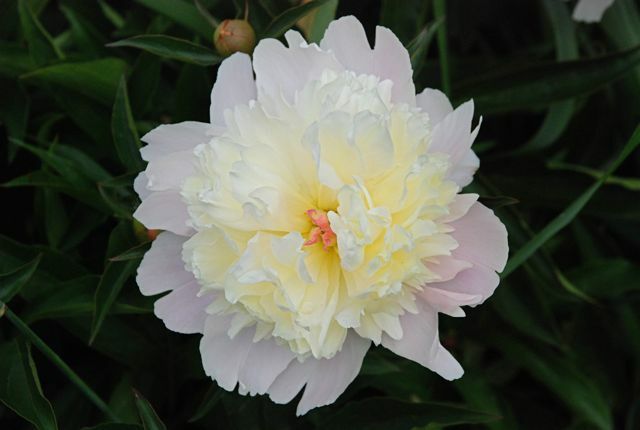 Peonies (Paeonia sp.) are small perennial shrubs that produce large, lovely flowers in the spring. 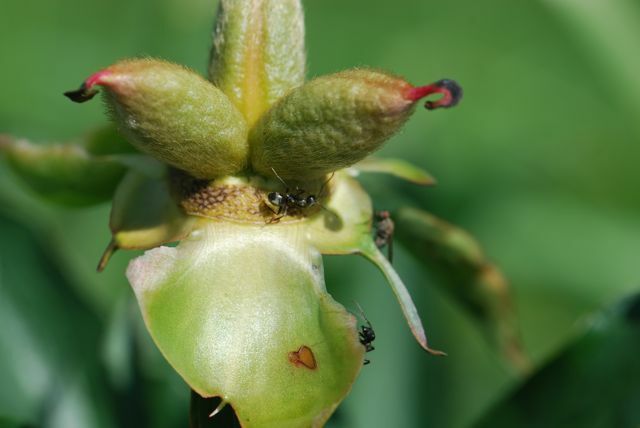 The flower buds produce nectar via extrafloral nectaries, which attract ants. 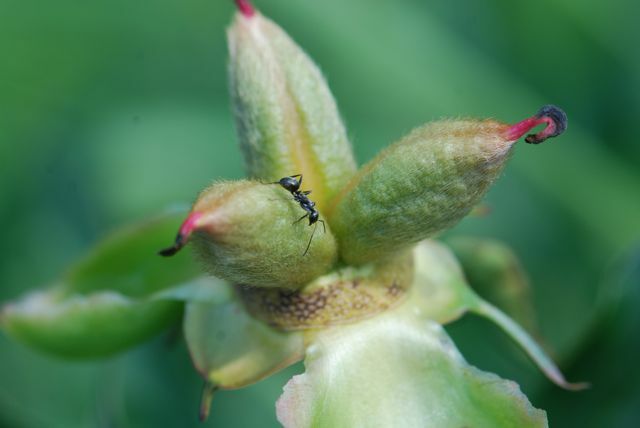 The ants chase off potential herbivores until the buds open. A simple story, yet an entire garden mythology has grown up around it. You can do an Internet search for “peony ants” and find a wealth of funny, and at times sad, myths. But there may be another piece of the story that is rarely mentioned. Since I already mentioned peonies, you can probably guess it is the fruit of a peony. Inside each of those three “pods” are rows of seeds completing development. As this is not a bud, what is an ant doing there? Take a look at the next few photographs and see what you think. Do you see the fly? Has anyone seen this before? Do you know if the extrafloral nectaries are still active? Are ants just poor botanists? B L Bentley. (1977). Extrafloral Nectaries and Protection by Pugnacious Bodyguards. Annual Review of Ecology and Systematics, Vol. 8: 407 -427. Sometimes it is nice to watch a video of nature if you can’t get out to see some yourself. Can you figure out where the nectaries are? Do you know what kind of ants these are? You get to see a lot of surprising things in the Sonoran Desert of the southwestern United States. How cacti provide nectar for ants is just one example. Most of us learned in school that flowers produce nectar, which is then collected by bees, butterflies, bats and/or moths. Extrafloral nectaries are structures on a plant that produce nectar, but they are not inside flowers. They may be located on petioles, leaves, sepals, or stems. Extrafloral nectaries are more common than you would think. Extrafloral nectaries are found in a wide range of different plants from over 70 different families, from buttercups to violets. 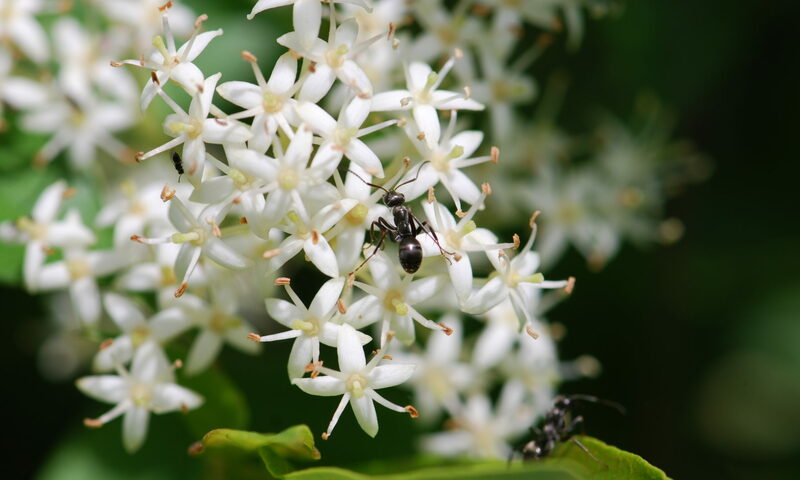 The primary visitors to all these extrafloral nectaries are ants. 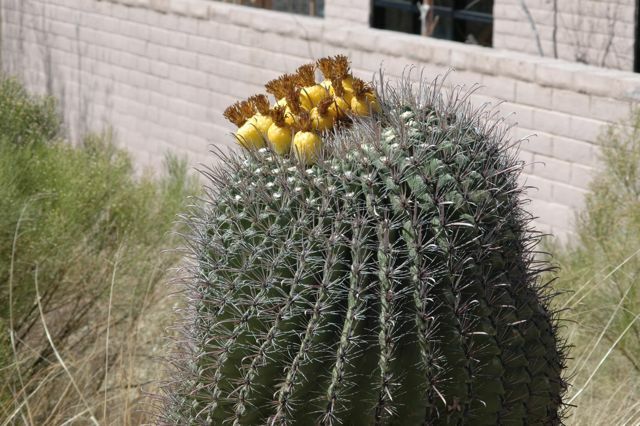 Believe it or not, extrafloral nectaries are present in many cacti. Cacti have many specializations for saving water, and even have a different system of photosynthesis that is more water efficient. This barrel cactus is not spineless (for the Circus of the Spineless folks). Yet, certain species of cacti also have tiny extrafloral nectaries within patches of spines, known as thorn nectaries, which may literally drip nectar. 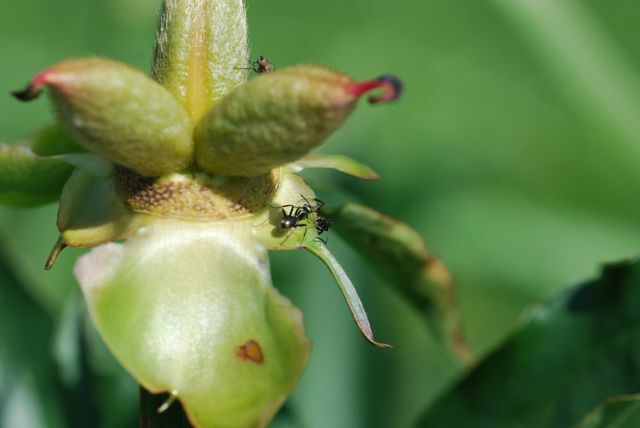 The plant is losing water (albeit probably in very small amounts), to in attract ants. The orangish, waxy bumps in the following photo are the nectaries. No one knows for sure why the cacti have extrafloral nectaries, and it is likely that different kinds of cacti have them for different reasons. Scientists have proposed that some cacti supply nectar to ants to keep them away from the flowers, where the ants might drive away pollinators. This seems unlikely since the extrafloral nectaries are active throughout the year or at different times of the year, not just when flowers are open. The cacti may supply nectar to keep the ants away from tending aphids, scales or mealybugs that might cause more problems for the plant, although ants don’t seem to tend some of the most prominent cactus-feeding species. 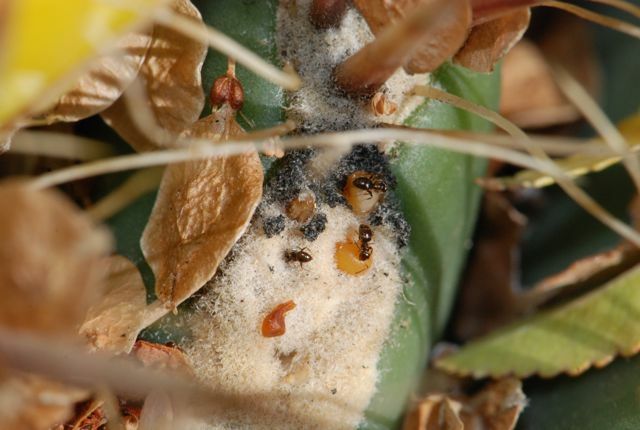 The cacti may supply nectar to lure ants into the area because the ants’ activity improves the texture and/or nutritional value of the soil immediately around the cacti. This last idea makes a lot of sense given desert soils are often low in organic matter and nutrients, and ants are known to improve soil. 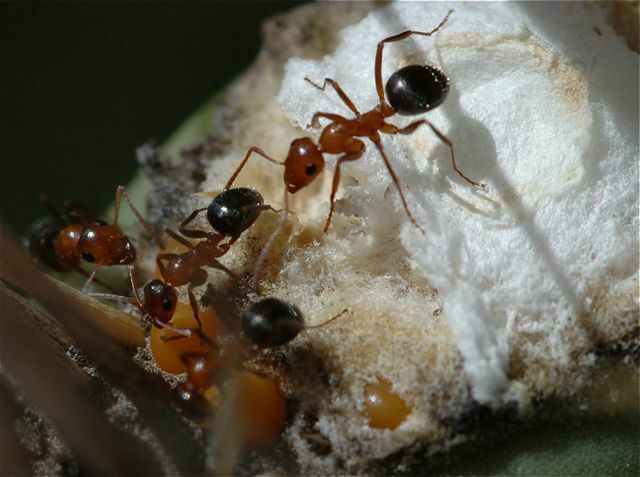 Also, ants may provide a cleaning service, keeping down disease-causing fungal spores and bacteria, as well as chasing away or eating disease-carrying pests. 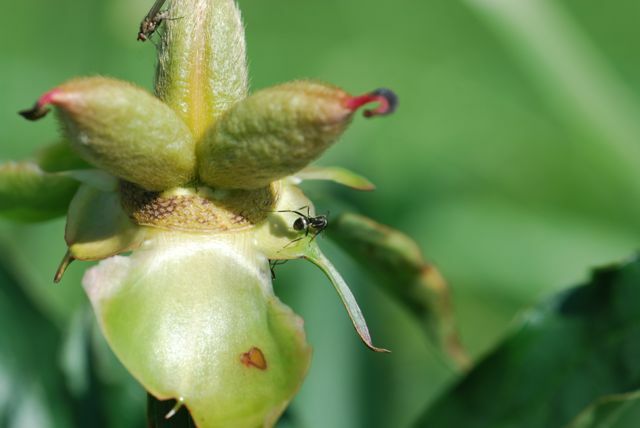 Ants may chase away seed-feeding bugs like these. On barrel cacti the nectaries are active when the plant has fruit, and the seed-feeding bugs are around. 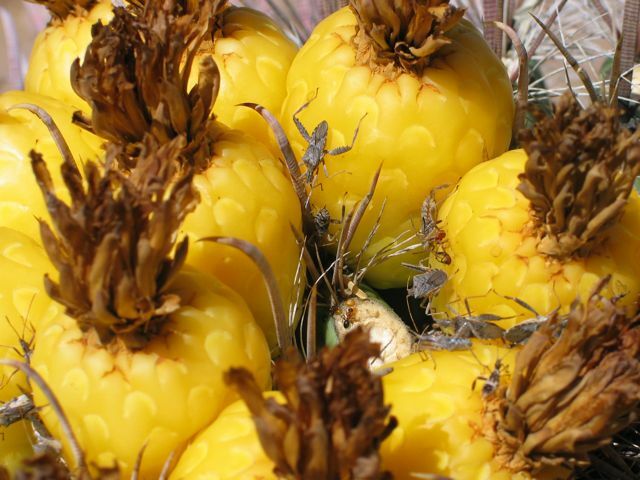 Can you see the ant and extrafloral nectary in the middle, between the fruit? Not only do a variety of native ants take nectar from cacti, but introduced species may as well. These tiny introduced Brachymyrmex gather nectar of the extrafloral nectaries of another barrel cactus. Do they perform the same duties as the native ants? Since we don’t know exactly what the ants are doing in most cases, it is hard to know for sure. 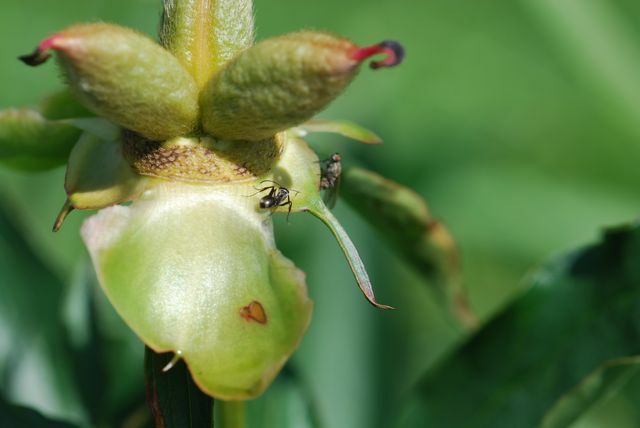 Have you ever seen ants visiting extrafloral nectaries? What do you think?